Home » VANDERBILT, WILLIAM H.
Longtime assistant to his father, "Commodore" Vanderbilt, William took the fortune he inherited from his father and built one of the foremost railroad empires in America. 1870, New York. Stock certificate for 1 share. Red with attached adhesive revenue at top right. Signed as Vice President by William H. Vanderbilt (1821 - 1885). Railroad magnate; Financier. Longtime assistant to his father, "Commodore" Vanderbilt, William took the fortune he inherited from his father and built one of the foremost railroad empires in America. Signed as Treasurer by Cornelius Vanderbilt, Jr. (1843-1899). Railroad executive. The first son of William H. Vanderbilt. Overall fine condition. Hole cancellations lightly affect William H. Vanderbilt's signature, Conelius' is unaffected. (1821-1885). Financier, philanthropist. Son of Cornelius Vanderbilt, William became president of the New York Central and Hudson River RR and affiliated corporations upon his father’s death in 1877. DS “W H. Vanderbilt,” 9pp legal folio. New York, Apr 24, 1874. 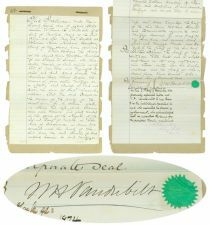 Legal instrument agreeing to convey property between Vanderbilt and The New York Central and Hudson River Railroad Company consisting of 11 acres between t64th and 65th Streets mortgaged to Joseph Dunyer by Vanderbilt. Boldly signed on last page above embossed corporate seal. Cover evidences edge chipping with some paper loss. Internally fine. WILLIAM H. VANDERBILT. DS. 4pp. 8" x 12". New York. September 1, 1874. 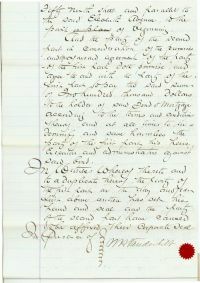 A lengthy legal document signed "W H Vanderbilt" concerning the railroads. It states in part: "...William H Vanderbilt...party of the first part and The New York and Central and Hudson Rail Road Company party of the second part...the second part heretofore purchased of one Lebbens B. Ward all that parcel of land situate in the City of New York and hereinafter described...the purchase price thereof except the sum of Two hundred thousand dollars...". The document continues with a minute description of the parcel, between 59th and 60th Streets and 11th and 13th Avenues. Vanderbilt's signature is dark and the pages have been attached to a larger, beige piece of paper. It is in very fine condition overall.